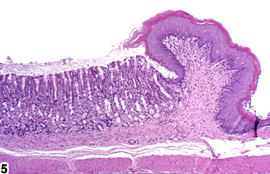 Stomach, Forestomach, Epithelium - Hyperplasia in a male F344/N rat from a subchronic study. The epithelial hyperplasia is diffuse. 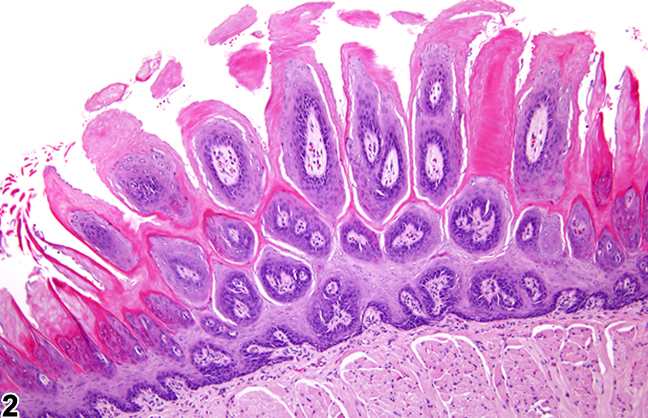 Stomach, Forestomach, Epithelium - Hyperplasia in a female F344/N rat from a chronic study. 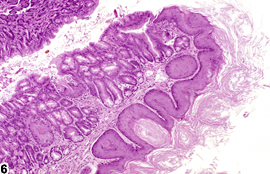 The epithelial hyperplasia is focal and papillary. Stomach, Forestomach, Epithelium - Hyperplasia in a male B6C3F1 mouse from a chronic study. Two exophytic, papillary foci of hyperplasia are present. Stomach, Forestomach, Epithelium - Hyperplasia in a male B6C3F1 mouse from a chronic study (higher magnification of Figure 3). A papillary focus of hyperplasia is present. Stomach, Forestomach - Normal limiting ridge in a male F344/N rat from a subchronic study. Stomach, Forestomach, Epithelium - Hyperplasia in a male B6C3F1 mouse from a subchronic study. 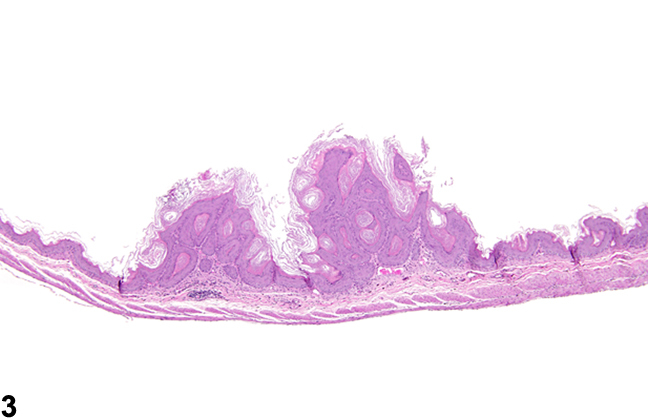 Epithelial hyperplasia of the limiting ridge is present. 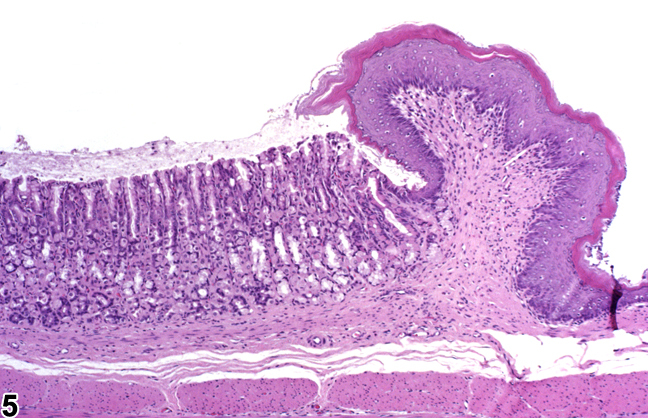 Stomach, Forestomach, Epithelium - Hyperplasia in a male F344/N rat from a chronic study. Hyperplasia of the basal cells is present in the forestomach. 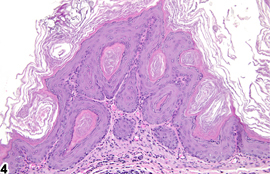 Stomach, Forestomach, Epithelium - Hyperplasia in a male F344/N rat from a chronic study (higher magnification of Figure 7). Hyperplasia of the basal cells is present in the forestomach. Hyperplasia is defined as an increase in the number of cells in one or more epithelial strata (basal, spinous, or granulosum). 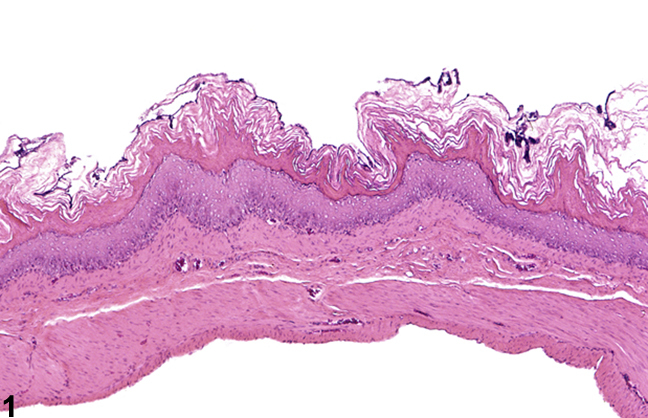 Hyperkeratosis (increased thickness of the stratum corneum) is often seen when hyperplasia of the mucosa is present. Hyperplasia may be diffuse ( Figure 1 , Figure 6 , Figure 7 , and Figure 8 ) or focal ( Figure 2 , Figure 3 , and Figure 4 ) and results in an increased thickness of the non-glandular stomach mucosa. Hyperplasia may also be seen at the limiting ridge ( Figure 6 ; compare with normal limiting ridge in Figure 5 ). Hyperplasia of the nonglandular stomach is often characterized as a uniform thickening of all layers of the epithelium without upward or downward projections. 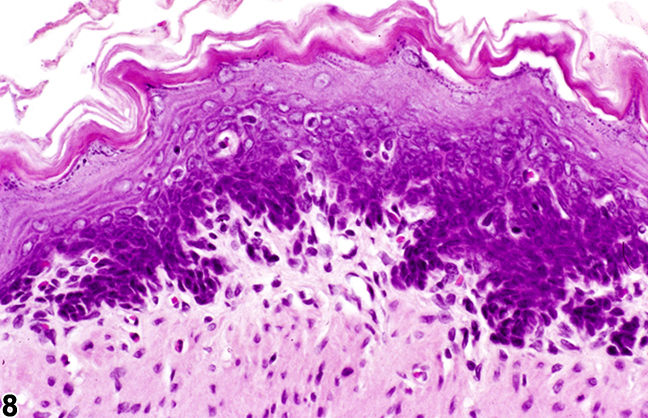 However, in more severe cases there are convolutions of the epithelium with downward projections of rete peg-like structures. 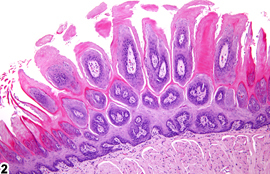 There may be proliferation of the basal cells, which can extend into the submucosa ( Figure 7 and Figure 8 ). Focal upward proliferation into the lumen mimicking papilloma may be present in more severe cases of focal hyperplasia and may be described as papillary hyperplasia in the narrative. The absence of a branching connective tissue core containing blood vessels and the presence of an intact muscularis mucosa distinguish this form of hyperplasia from a true papilloma. With hyperplasia, there remains some degree of orderly maturation. Hyperplasia should be diagnosed and graded whenever present. The modifiers "focal" and "diffuse" should be used whenever possible. Grading should be based on the size, extent of distribution, and thickness of the epithelium. Multifocal lesions are not recorded as "multifocal" but are given a higher severity grade than single lesions. If there are features of atypia, such as diskeratinization, disorganization, or the presence of atypical cells, then atypical hyperplasia should be diagnosed (see Stomach, Forestomach, Epithelium - Hyperplasia, Atypical). If the pathologist feels that two distinct hyperplastic processes are present (e.g., diffuse and atypical), then both should be diagnosed and thoroughly described in the pathology narrative. 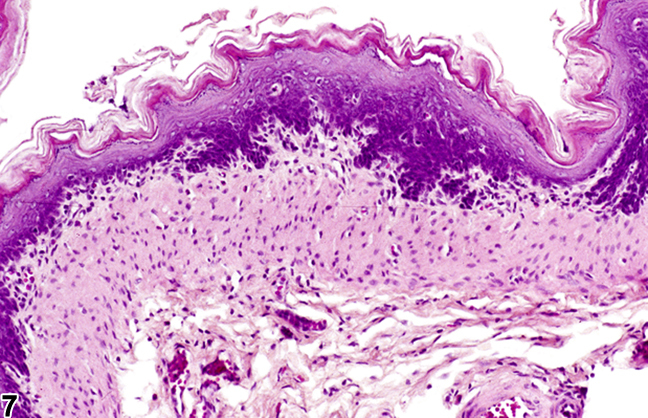 Hyperkeratosis associated with hyperplasia is usually not diagnosed as a separate entity, unless it is a prominent component of the lesion, but it should be described in the pathology narrative. Betton GR, Salmon GK. 1984. Pathology of the forestomach in rats treated for one year with a new H-2 receptor antagonist, SK&#38;F 93479 trihydrochloride. Scand J Gastroenterol Suppl 101:103-108. Boorman GA, Hong HL, Jameson CW, Yoshitomi K, Maronpot RR. 1986. Regression of methyl bromide-induced forestomach lesions in the rat. Toxicol Appl Pharmacol 86:131-139. Chan PC, Mahler J, Peddada S, Lomnitski L, Nyska A. 2003. Forestomach tumor induction by 2,4-hexadienal in F344N rats and B6C3F1 mice. Arch Toxicol 77:511-520. Frederick CB, Hazelton GA, Frantz JD. 1990. The histopathological and biochemical response of the stomach of male rats following two weeks of oral dosing with ethyl acrylate. Toxicol Pathol 18:247-256. National Toxicology Program. 2002. NTP TOX-70. Toxicity Studies of p-tert-Butylcatechol (CAS No. 98-29-3) Administered in Feed to F344/N Rats and B6C3F1 Mice. NTP, Research Triangle Park, NC. National Toxicology Program. 2007. NTP TR-543. Toxicology and Carcinogenesis Studies of alpha-Methylstyrene (CAS No. 98-83-9) in F344/N rats and B6C3F1 mice (Inhalation Studies). NTP, Research Triangle Park, NC. National Toxicology Program. 2010. NTP TR-544. Toxicology and Carcinogenesis Studies of Dibromoacetonitrile (CAS No. 3252-43-5) in F344/N Rats and B6C3F1 Mice (Drinking Water Studies). NTP, Research Triangle Park, NC. Nera EA, Lok E, Iverson F, Ormsby E, Karpinski DF, Clayson DB. 1984. Short term pathological and proliferative effects of butylated hydroxyanisole and other phenolic antioxidants in the forestomach of Fischer 344 rats. Toxicology 32:197-213. Nyska A, Moomaw CR, Lomnitski L, Chan PC. 2001. Glutathione S-transferase pi expression in forestomach carcinogenesis process induced by gavage-administered 2,4-hexadienal in the F344 rat. Arch Toxicol 75:618-624.